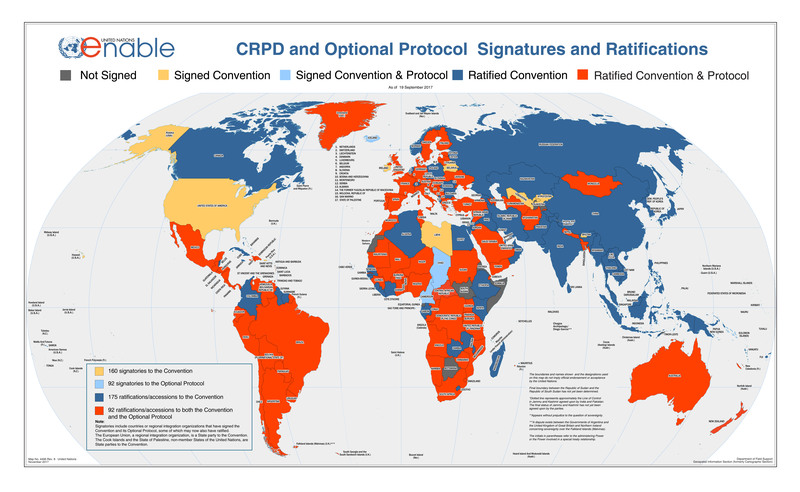 – The CRPWD was adopted on 13 December 2006 at the United Nations Headquarters in New York, and was opened for signature on 30 March 2007. There were 82 signatories to the Convention, 44 signatories to the Optional Protocol, and 1 sanction of the Convention. This is the highest number of signatories in history to a UN Convention on its opening day! – It is the first comprehensive human rights treaty of the 21st century and is the first human rights convention to be open for signature by regional integration organizations. – It takes to a new height the movement from viewing persons with disabilities as “objects” of charity, medical treatment and social protection towards viewing persons with disabilities as “subjects” with rights, who are capable of claiming those rights and making decisions for their lives based on their free, and informed consent as well as being active members of society. – The Convention is intended as a human rights instrument with an explicit, social development dimension. – It adopts a broad categorization of persons with disabilities and reaffirms that all persons with all types of disabilities must enjoy all human rights and fundamental freedoms. – It clarifies and qualifies how all categories of rights apply to persons with disabilities and identifies areas where adaptations have to be made for persons with disabilities to effectively exercise their rights and areas where their rights have been violated, and where protection of rights must be reinforced. – The Convention is the fastest negotiated human rights treaty. I noticed that Venezuela, Chad, Zaire, Angola, Botswana, Zimbabwe, Somalia, Western Sahara, Mauritania, Lesotho, Iraq, Afghanistan, Tajikistan, Kyrgyzstan, Burma, Papua New Guinea, North Korea and Ukraine have not signed the Convention so let’s keep our thoughts with those who have disabilities in those countries, and hope that soon their governments and leaders will get on board. As people with disabilities, it’s our responsibility to make the convention known to those who have not been able to access it for any reasons. This is the best way to defend and protect our rights as citizens.